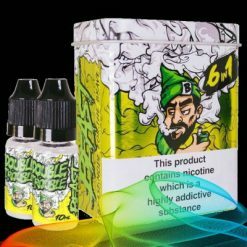 Beast Cloud is a well known Malaysian Brand for vape juice, launched in 2014. Well known all over the world and in very high demand. Beast Clouds combines a mix of the best blends in a really unique and sophisticated way. The combination of secret fruity blends with extraordinary creamy confectionary flavours is simply mind-blowing. This unique and contemporary taste will make you use these flavours all day long. Beast cloud offers you to experience the vaping in a unique and stylish way. Now you can choose the Malaysian Beast Cloud in two exciting and unique flavours. The Beast Cloud is available in Frost Blood and Double Trouble Flavours. Both of the flavours have their own uniqueness. If you haven’t experienced any of these flavours then it is a must try. Once you have experienced these flavours every other flavour will become mild for you.